We now live in a world where governments print worthless pieces of paper to buy other worthless pieces of paper that combined with worthless derivatives, finance assets whose values are totally dependent on all these worthless debt instruments. Thus most of these assets are also worth-less. So the world financial system is a house of cards where each instrument’s false value is artificially supported by another instrument’s false value. The fuse of the world financial market time bomb has been lit. There is no longer a question of IF it will happen but only WHEN and HOW. The world lives in blissful ignorance of this. Stockmarkets remain strong and investors worldwide have piled into government bonds in a perceived flight to safety. Due to a century of money creation (and in particular since the 1970s) by governments and by the fractal banking system, investors believe that stocks, bonds and property can only go up. Understanding risk and sound investment principles has not been necessary in these casino markets with guaranteed payouts for anyone who plays the game. Maximum leverage and derivatives have in the last 10-15 years driven markets to unfathomable risk levels, with massive rewards for the participants. In the meantime central banks are cranking up the printing presses but as Bernanke recently said quantitative easing is an “inappropriate” description of what should be called “securities purchases”! Who is he kidding? What the Fed is buying has nothing to do with “securities”. There is no security whatsoever in the rubbish the Fed is purchasing. They are buying worthless pieces of paper with worthless pieces of paper. This is the Ponzi scheme of all Ponzi schemes. Let us be very clear, this financial Shangri-La is now coming to an end. The financial system is broke, many western sovereign states are bankrupt and governments will continue to apply the only remedy they know which is issuing debt that will never ever be repaid with normal money. So why does the world still believe that the financial system is sound? Firstly, because this is what totally clueless governments are telling everyone and this is what investors want to hear. Secondly, whether governments apply austerity like in parts of Europe or money printing as in the US, investors want to believe that any action by government is good, however inept. Thirdly, market participants are in a state of false security due to shortsightedness and limited understanding of history. Fourthly, as long as they can benefit from inflated and false asset values, the market participants will continue to manipulate markets. Fifthly, there has been a very skilful campaign by the US to divert the attention from their bankrupt economy and banks `to small European countries like Greece, Ireland or Portugal. These nations, albeit in real trouble, have problems which are miniscule compared to the combined difficulties of the US Federal Government, states, cities and municipalities. 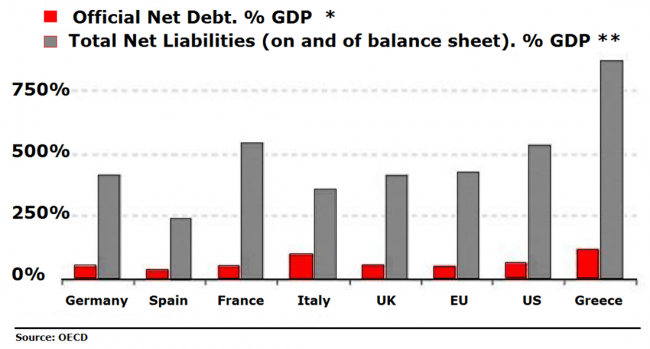 Euro zone members can’t print money. Many EU countries are downgraded by US rating agencies which don’t dare to touch the US rating. The AAA rating of the US is an absolute sham and totally politically motivated. True to form, rating agencies will only downgrade debt once it has become worthless but never before. The result of massive money printing is a collapsing currency, leading to escalating prices and eventually hyperinflation. This is in simple terms how every hyperinflationary period in history has happened. If in addition, there are world shortages of food, energy and other commodities, this will accelerate the process. Fiscal Gap widening at alarming rates in many major economies. Commodity prices at all-time highs. Long term interest rates rising. Precious Metals at all-time highs against most currencies. Commodity prices have increased 26% in the last 12 months and 77% in the last 24 months based on the Continuous Commodity Index (CCI). So whilst most economies publish inflation rates of 1-3%, the real cost of food and energy is surging. The US government, which doesn’t eat or use energy, recently published the adjusted 12 months’ Consumer Price Index (ex food and energy) of 0.8% per annum. Whilst most people are struggling with a massive increase in their cost of living, the US government is continuously adjusting and manipulating the published figures. There are lies damn lies and US government statistics. Who are they fooling! In spite of US government debt being totally worthless, investors have bought more than ever, with virtually no return, in a world drowning in sovereign debt paper. We have for some time stated that the US bond market is one of the biggest financial bubbles ever. As we forecast back then, the market turned down (rates up) in January 2009. A 14 month correction ended in August 2010. 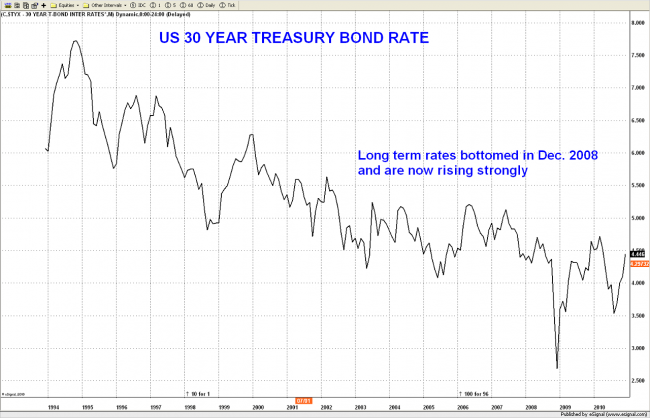 Since then both the 10 year and 30 year US Treasury bonds have moved up one full per cent. So investors are finally waking up to the enormous risks in the financial system by selling government debt. We expect both short and long interest to surge in 2011 in many countries and to reach well into double digits in the next few years. In spite of interest rates at minimal levels, both sovereign states and individuals have major problems servicing current debt. With interest rates likely to rise to at least 12-15% and probably higher, no one will be able to service debt with “normal money”. Add to that the fact that government debt will surge in most countries. The US debt is currently $ 14 trillion. It is likely to rise to at least $20 trillion in the next few years and probably a lot higher. The interest cost for the US government at that stage is likely to be at least double the tax revenue. One would assume that the US government is well aware of what their ruinous actions are leading to. But in spite of this, they continue to increase the deficit by reducing fiscal revenues and increasing spending. What planet are they living on! What is absolutely self-evident is that they will not clear up their own mess, as the present government will be a one term wonder! Since 1971, the value of the US dollar (paper money) has gone down 97.5% against real money (gold). Since Nixon abolished gold backing of the US dollar in 1971, both the dollar and most other currencies have been totally destroyed by reckless government. Nixon should not have been impeached for Watergate. Instead he should have been prosecuted and jailed for destroying the world’s currency system. Concurrently, banking developed into a fractal system whereby banks could lend massive multiples of their deposits and capital. All of this has served to drive up asset prices to totally unsustainable levels. All currencies are declining against gold but some faster than others. 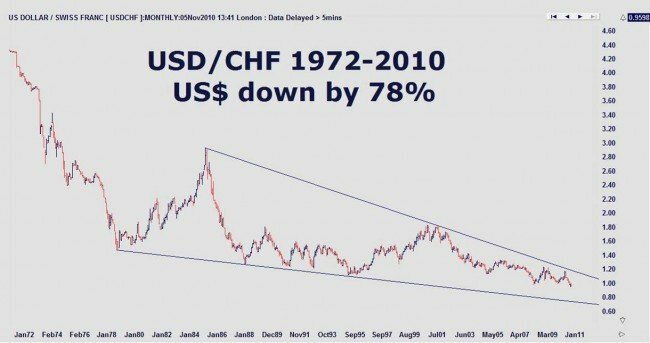 The US dollar for example is down 78% against the Swiss Francs since 1972. During the same period the pound has declined a massive 85% against the Swiss Franc. Both the dollar and the pound are now at all-time lows against the Swiss currency. But the Swissy is only strong relative to weak paper currencies because against real money/gold the Swiss Franc has declined 87% since 1972. As a consequence of accelerated money printing, all paper currencies will fall precipitously against gold in the next few years. Therefore all paper money should be avoided and especially the Dollar, the Pound and the Euro. Gold has gone up 40 times against the Dollar in the last 40 years and almost 6 times in the last 11 years. Very few investors have participated in this rise since the 1999 low at $ 250. Less than 1% of world financial assets are invested in gold and gold stocks. 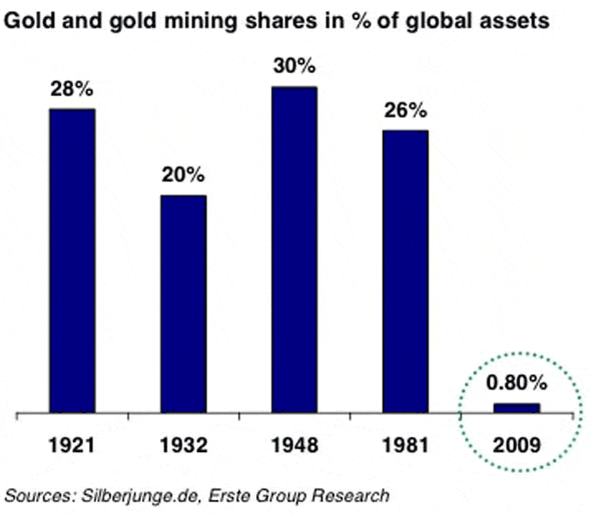 Between 1920 and 1980 circa 25% of financial assets were invested in gold and gold stocks. The major rise in gold in the last 11 years has been a stealth move with very few investors participating. The dilemma is that there is not enough gold to satisfy the coming increase in demand. We have in previous articles forecasted the gold price to reach anywhere between $ 6,000 and $ 10,000 in the next few years – see “Gold entering a virtuous circle”. As we explained at the time, these are totally realistic targets without the effect of hyperinflation. Bearing in mind that we are likely to see hyperinflation in the US, the UK and many European countries, the $6-10,000 target for gold is much too low. The dilemma is that it is absolutely impossible to predict how much money will be printed by governments. In the Weimar republic gold reached DM 100 trillion. But it is really irrelevant what level gold and other precious metals will reach in hyperinflationary money. 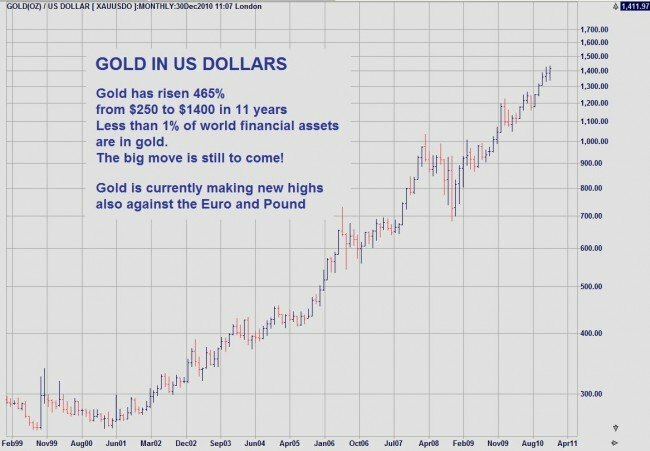 What is much more important to understand is that physical gold (and silver) will protect investors against losing virtually 100% of the purchasing power of their money. Whatever real capital appreciation gold will have in the next few years is of less importance. But what is vital, is that physical gold (stored outside the banking system) is the ultimate form of wealth protection both against a deflationary collapse and a hyperinflationary destruction of paper money. Throughout history gold has protected investors against various calamities but this time, holding physical gold will be absolutely critical to financial survival.